By fusing ample space with dynamic power and sleek design, each Sports Activity Vehicle® delivers the thrills of a BMW. And along with the unique Sports Activity Coupe®, there truly is an X perfect for every adventure. Tulley BMW of Manchester, located at 170 Auto Center Rd., Manchester, New Hampshire, takes pride in our helpful staff, our great selection of Pre-Owned BMW and other pre-owned cars, and all that we do to make your car buying experience the best you have ever had. Our pre-owned BMW dealership has helped drivers from Hooksett, Nashua, Concord, NH, and Derry, NH, get into the BMW car of their dreams, and we know we can do the same for you. We strive to be one of the premier used car dealers Concord NH and Bedford citizens turn to. Search our selection of Certified Pre-Owned BMW models, and other fine pre-owned cars for sale in Manchester, NH. If you’re looking for a vehicle to drive on the streets of Manchester NH in style, check out our large inventory of certified pre-owned BMW cars, including the 2 Series, 3 Series, 5 Series, and 6 Series. We have a wide range of used cars Manchester NH drivers can rely on for getting around town without having to fill the gas tank, to hauling equipment or the kids. The service you’ll get at Tulley BMW of Manchester will be 2nd to none! If you’re not searching for pre-owned BMW, we also have a large inventory of pre-owned vehicles from some of today’s top manufacturers. Whether it is a car, truck or SUV, we are sure that we have something for you. Browse our pre-owned car page to see all that we have to offer. We can help you secure BMW financing at your local pre-owned BMW retailer in Manchester, NH. For a low interest pre-owned car loan in Manchester, NH, visit our finance department. The Tulley BMW of Manchester finance team is here to assist you through the entire car loan process. We are the certified pre-owned and pre-owned car dealer that will work to find the finance option that works for you! Start the approval process right now by filling out our secure car loan application online before visiting one of the best used car dealers Manchester has to offer. Trust your luxury car to the experts at our car repair center and certified BMW parts center in Manchester, NH. If you purchase a BMW car at Tulley BMW of Manchester we want to make sure your car stays in like-new condition. Our service center can provide manufacturer maintenance and if anything were to ever happen to your car, our Manchester, NH, car repair center will quickly get your car back on the road. If it’s pre-owned BMW car parts you need, our parts specialists can assist you in picking out the correct part and quickly order it. Turn-around time for parts orders is often the same day! All of the employees at Tulley BMW of Manchester would like to thank you for your interest in our dealership. We look forward to having the opportunity to earn your business. 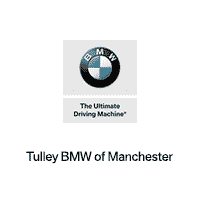 Tulley BMW of Manchester	42.950321, -71.436996.